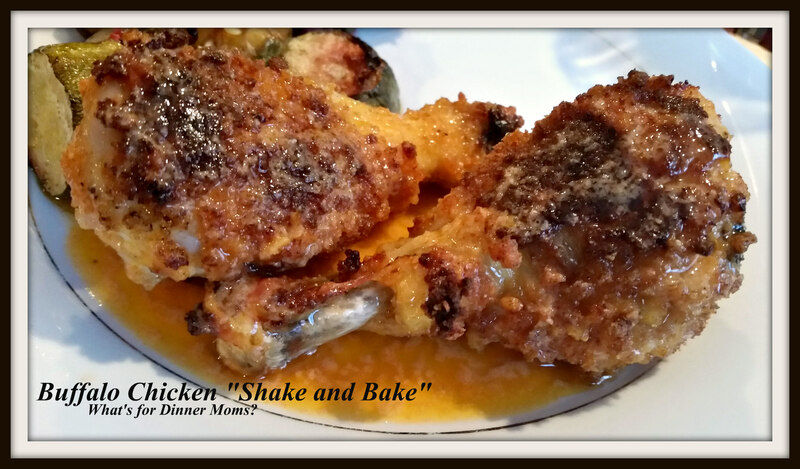 Crispy Buffalo Chicken Drumsticks – What's for Dinner Moms? Lately chicken thighs and chicken drumsticks have been super inexensive in our area – $.77 a pound. I only buy meat when it is on sale and then tend to stock up with 20-30 pounds at a time. So, you will be seeing lots of chicken recipes the next few weeks. I love Buffalo flavored anything. I have made dips, casseroles and even macaroni and cheese. with that tangy Buffalo hot/spicy taste I love. So, why not make Buffalo Chicken? These are not the little chicken wings we are used to but they still have that same great flavor. You can either use homemade “Shake and Bake” which is super simple to make or buy a box if you don’t have time. Either way will work just fine. Well since there was not a bite left in the pan at the end of dinner I would say these were a definite hit! We have not had Buffalo Chicken in ages and since I was able to bake it and still have it have a bit of crunch to it the kids didn’t even seem to mind that it wasn’t deep-fried wings. I served this with Yummy Roasted Vegetables (click for link to recipe), ranch or blue cheese for dipping, and a side salad. Tip: Don’t throw away the heels or ends of bread no one wants to eat. Keep a bag in your freezer and collect them until you have enough to grate or put through your food processor. Store in covered container in your refrigerator up to one month and up to three months in your freezer. The bread crumbs will be much better tasting than almost anything you can buy at the store. Note: If using boxed Shake and Bake following directions on box pouring sauce over chicken just before serving. Preheat oven to 400 degrees. Prepare a large rimmed baking sheet by covering with aluminum foil and spraying with non-stick spray. In a large storage bag mix together bread crumbs, oil, salt, paprika, black pepper, garlic powder, onion powder, basil, parsley, and oregano until well combined. Drop in chicken drumsticks 2 or 3 at a time and shake well until chicken is well coated. Remove chicken to prepared baking sheet. Continue until all pieces of chicken are coated. Bake chicken 35-45 minutes (depending on size of drumsticks). Turn chicken over half way through baking time. Once chicken is cooked through remove from oven. In a bowl mix together 1/2 cup butter (melted), hot sauce, and garlic powder to taste. If you like your sauce hotter add more hot sauce and a dash of Cayenne pepper if desired. If you like it milder add a bit more butter and garlic to the sauce. Dip chicken pieces in the sauce just prior to serving so they don’t get soggy. I love buffalo flavored anything as well. This is a jolly nice recipe, Marci. Thanks for sharing. Thank you so much! Also thank you for sharing it! Buffalo is the way to my heart! I love it spicy! I am a=on a big chicken kick lately to! It is so inexpensive lately. These look like they would be very popular! Always a great idea to take advantage of the sales, too. I love buffalo flavored anything too, and these look yummy.